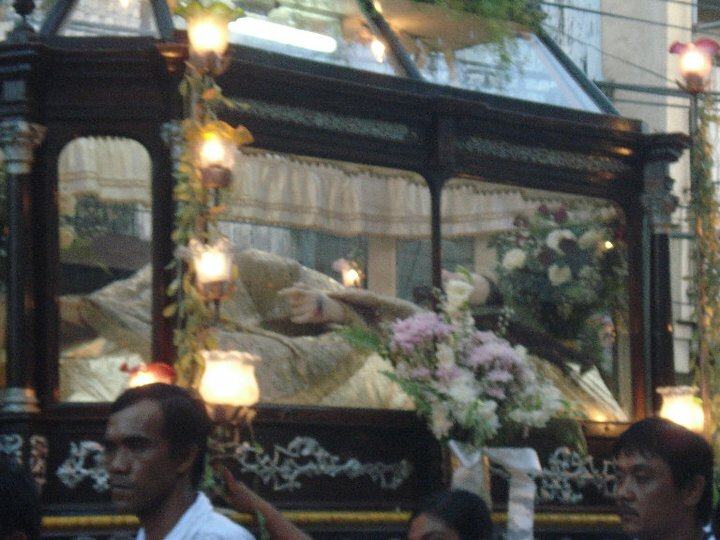 We woke up at 4.a.m., ate breakfast and went to Sta. 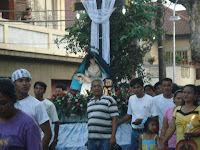 Lucia, Ilocos Sur to fetch our other companions. 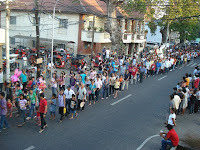 We arrived at 5:30 a.m. but everyone there was still unprepared so we joined them again for another set of breakfast. 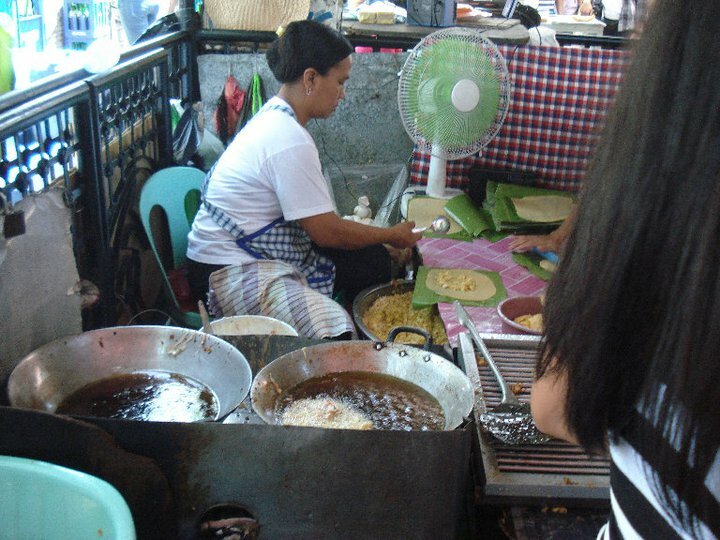 Many dishes were prepared: bulalo, pata tim, malaga with black beans, roasted chicken, salted egg, pinakbet and puto. We couldn't finish them all so we brought a whole pata tim with us. 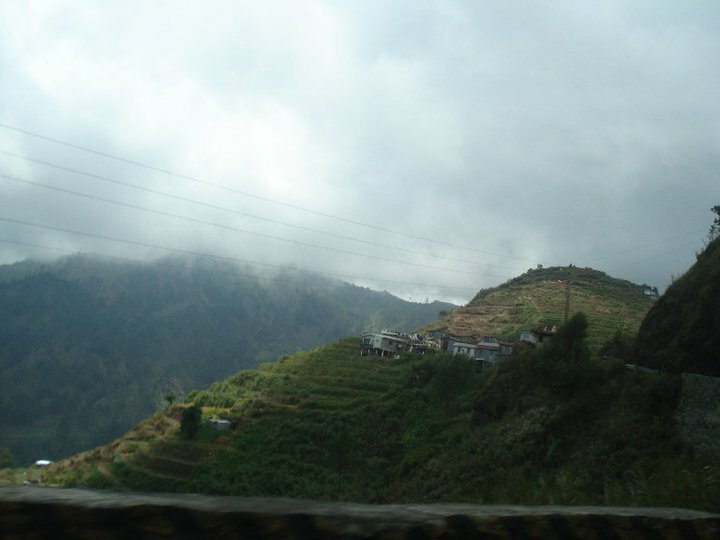 (This was unfortunately spoilt during the trip) At around 7:00 a.m., we left for Sagada on a 4-car convoy. 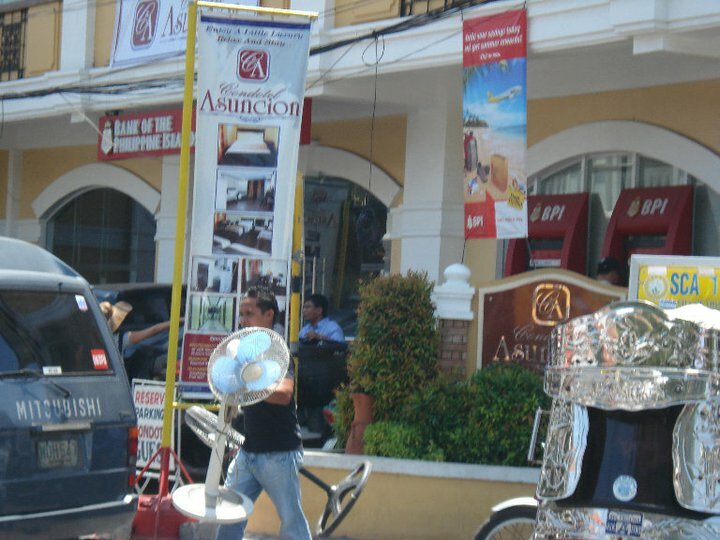 We arrived at Baguio City at 9:00 a.m. to fetch our cousin who attended a summer camp. 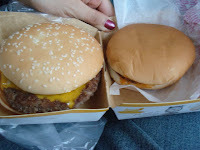 We then ate our lunch at Mc Donalds and bought Off! lotions and other various items from convenience stores. We passed by the gasoline station for a full tank and left baguio city at around 12:00 p.m.
We drove across the curvy roads of Benguet mountain province. 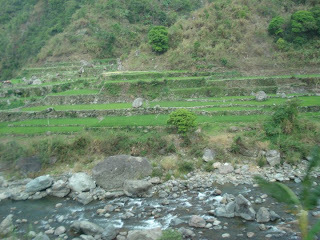 Looking outside the window of our van, we were awed by the natural green scenery of the trees, the rivers than ran between the mountains, the foot bridges connecting the mountains and the stair-like structure of the plantation fields. 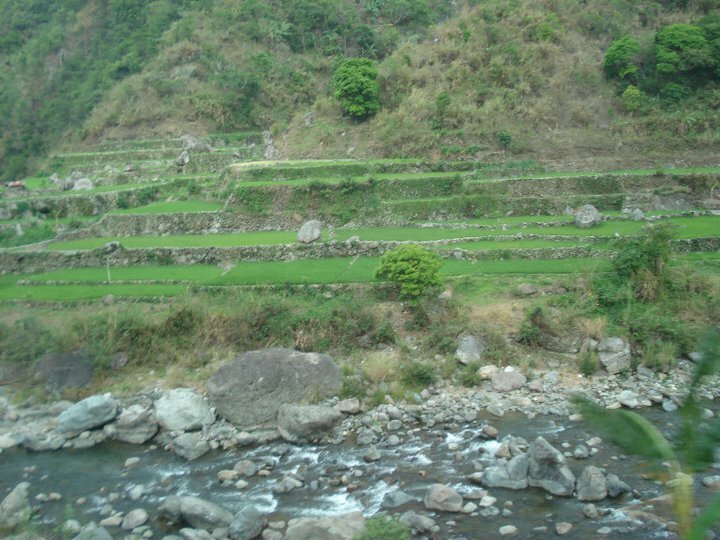 We used to think there was only one place for stair-like plantations but we encountered so many of them. 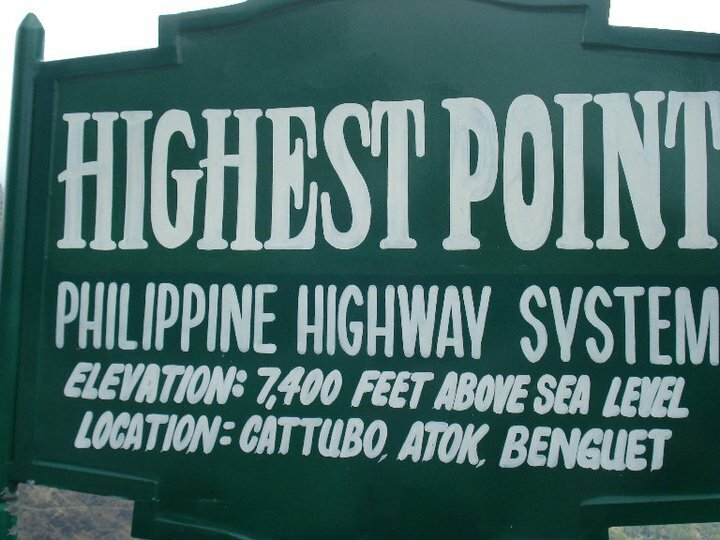 We soon reached the highest point at Atok, Benguet. Like many others, we stopped for picture taking. It was also a good opportunity to give our mobile vehicles some rest. During travels involving curvy roads, the brakes are often used and they need some tire to cool off to prevent them from getting worn out. After 15 minutes of taking photographs, enjoying the scenery and the cool mountain breeze, we continued our journey. 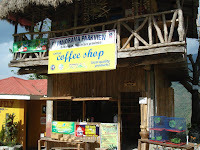 After an hour, we reached Kafalig Coffee Shop. 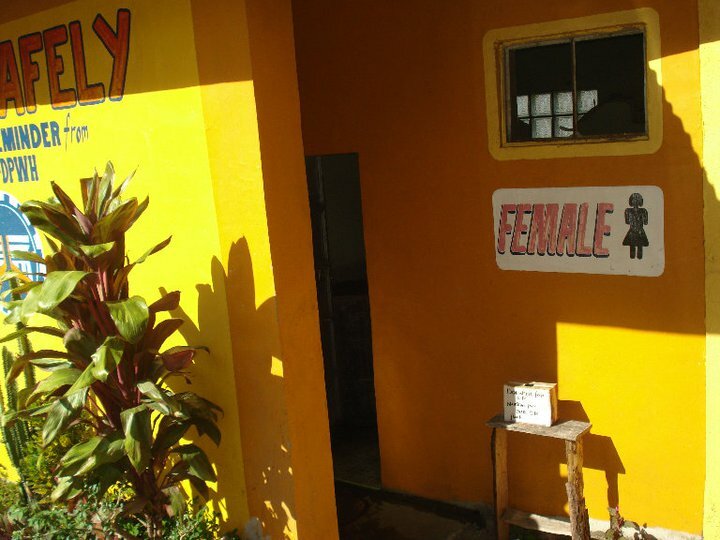 We again parked our vehicles and went to the rest rooms=) To our surprise, it was clean. 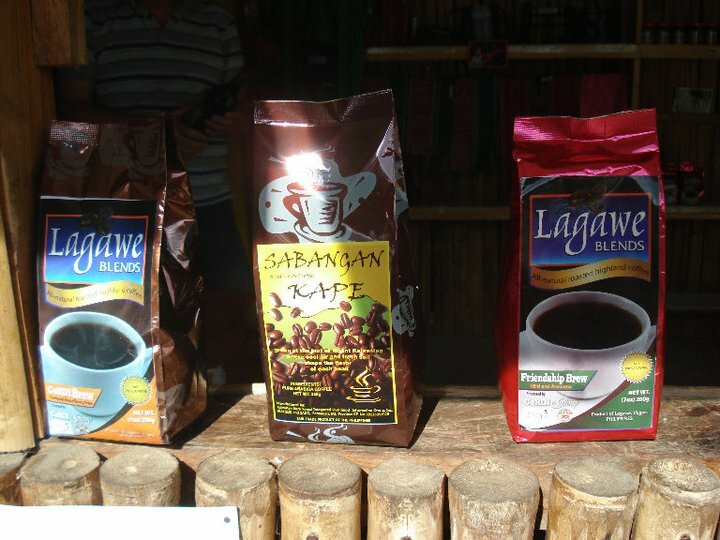 We then went up the hut to enjoy the view while drinking its delicious freshly brewed mountain coffee (worth 20 php). I was looking at the map of the mountains posted at the bamboo-like walls of the hut when one of the foreginers also in the hut drinking coffee approached me. He invited me to join their mountaineers camp below in Mt. 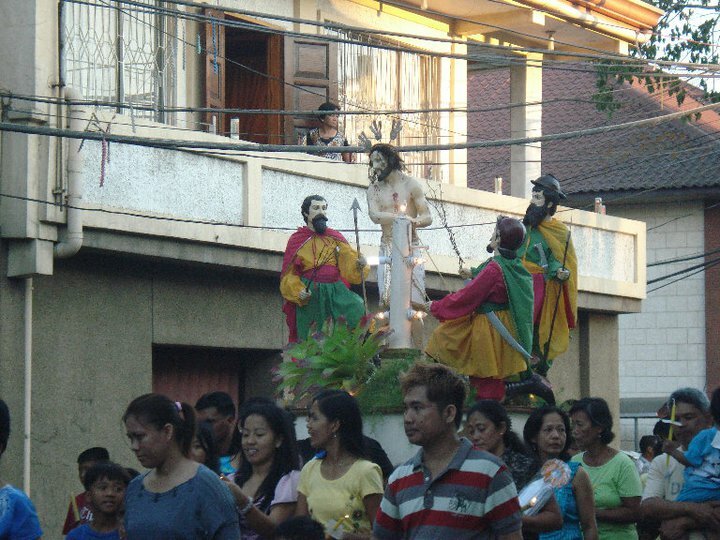 Kalawitan. He said it was a 3-day camp. He also showed me their guest book full of photographs of people trekking in the mountains. I politely said that we couldn't since we were already booked our stay in Sagada. 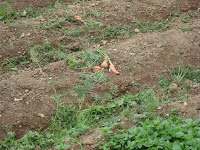 However, it looked interesting and maybe someday we will try that. After our coffee went down to visit the small shop below selling wines, jams and coffee. While standing to take a look a mountain dog went near me for a sniff. Then we got back to our van. 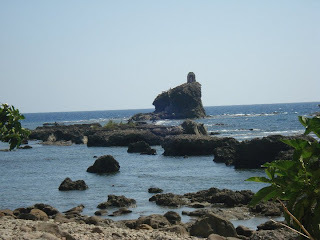 We passed by San Esteban Beach, Ilocos Sur just to take pictures. We were told by our driver that the shooting of the movie "Panday" took place there. We could see why. The rock formations along the beach is beautiful. We also noticed that there is a statue of Mama Mary at the top of one of the tall rocks formation. This was our last stop for the day. 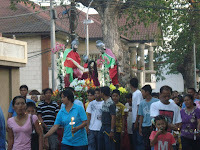 It was already 3:00 p.m., the town processions were about to start and we didn't want to be stuck in the middle of it. The water was clean since only a few were swimming there. 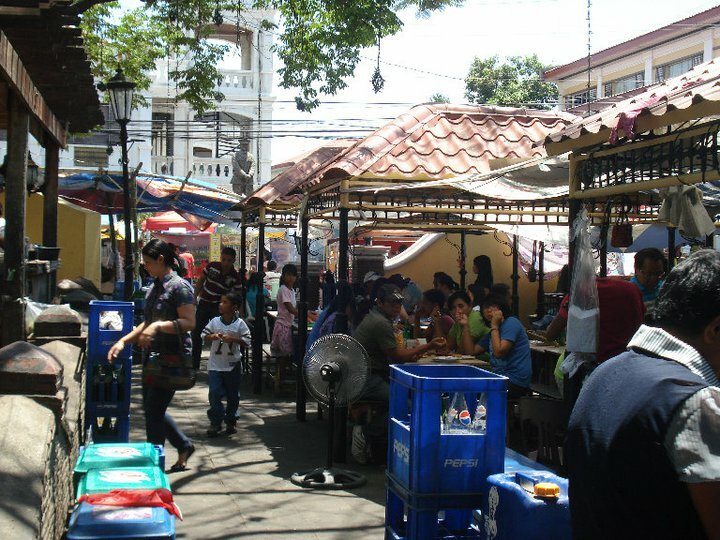 We recalled the last time we visited there, it was dirty with plastic bags and food wrappers everywhere. Seeing the clear cool water, we couldn't resist it. 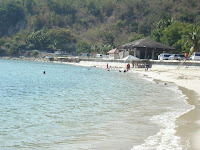 We just had to dip our legs and enjoy the feeling of wet sand rubbing our feet. 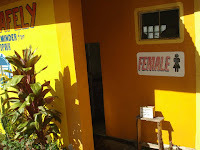 We then washed our feet at the nearby beach restroom for a minimal fee (5 php). We arrived at Sta. Lucia, Ilocos Sur at 3:30 p.m. Around this time, the entire town was preparing for the procession. The church and the plaza was getting crowded. 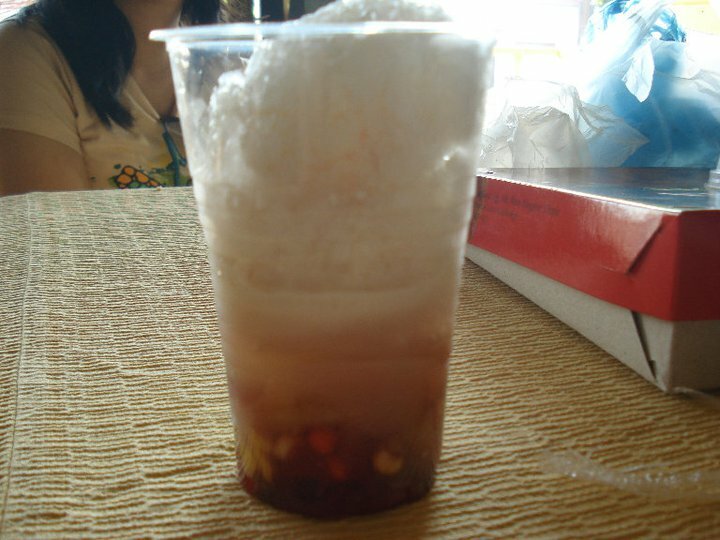 While waiting for the procession to start, we ordered halo-halo (worth 25 php) from the carinderia by the plaza. The halo-halo there was different from all others I've tasted. It had melon strips, pineapple chunks and sweetened bananas. 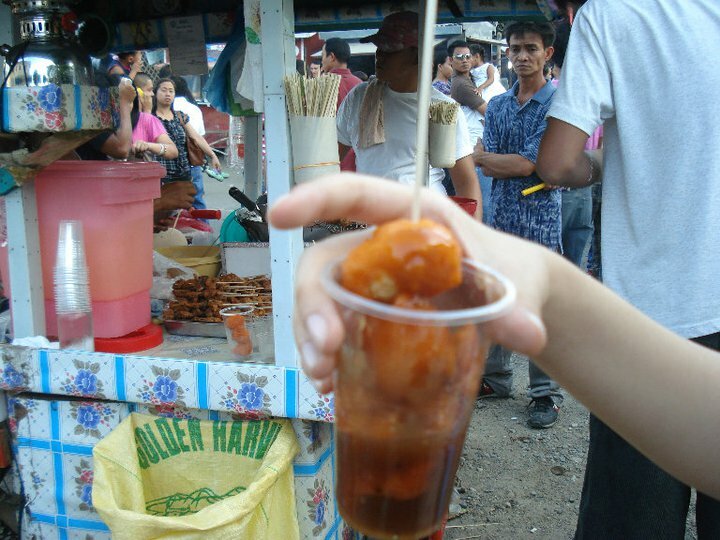 Instead of having ice cream, ube or plain milk as flavoring, it tasted like fruit cocktail syrup. My companions didn't like it. But for me it was okay. It was what I needed be cooled down after being exposed for long hours under the heat of the sun. 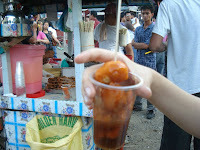 After our halo-halo, we bought the tastless "Kwek-kwek" (worth 10 php) from a vendor in the plaza. The sweet sauce tasted weird too. 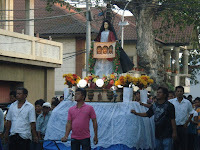 At around 5:00 p.m the procession started and we all went downstairs bringing our candles to watch. 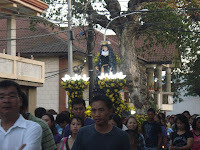 After the procession, there was a brownout. We ate dinner with candles and lamps. We called Meralco and they informed us that the electricty will resume by 9:00 p.m. We played charades to avoid the boredom of waiting for the lights to come back. However, it was already 11 p.m. and still darkness reigned the area. We decided we should go back to Candon City, Ilocos Sur to sleep despite the absence of lights and air-conditioning. 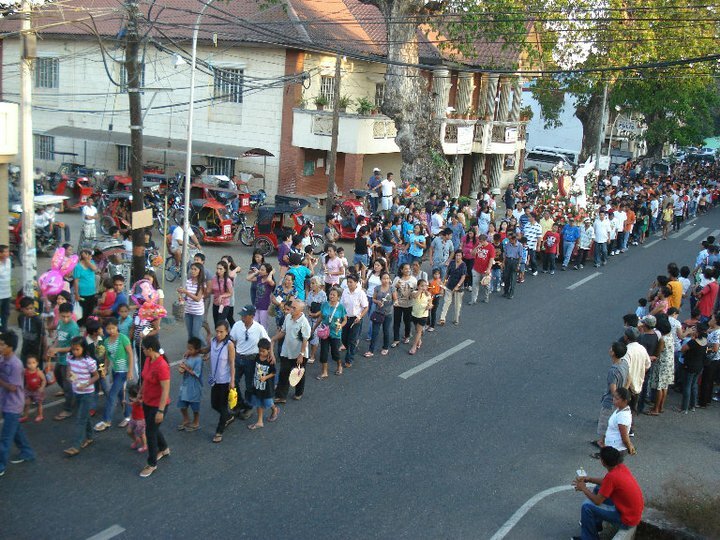 Every house and building in Sta. 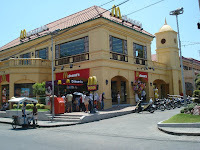 Lucia and Candon City had no lights except for Mc Donalds. 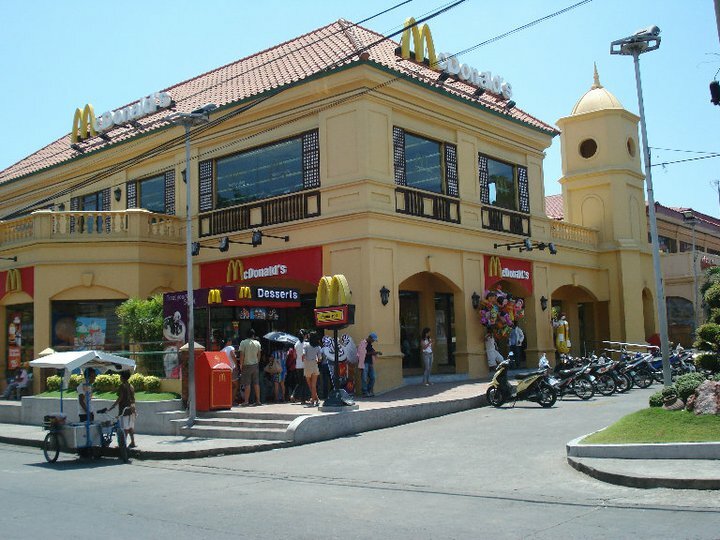 Even at such a late hour, many were inside and outside Mc Donalds. 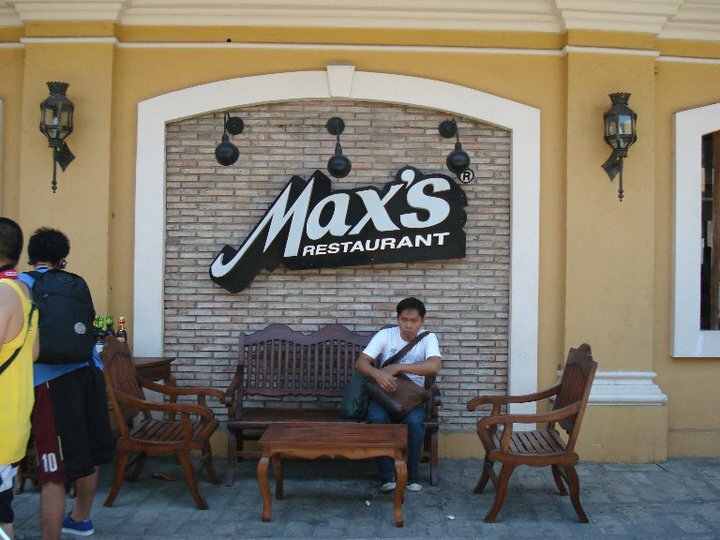 We were tempted to dine in as well but we resisted since we had to sleep to prepare for our intended early departure for Sagada the next day. We couldn't sleep since it was hot and we were being swarmed by mosquitoes. It was only utnil the power came back at 2 a.m. that we were able to sleep. 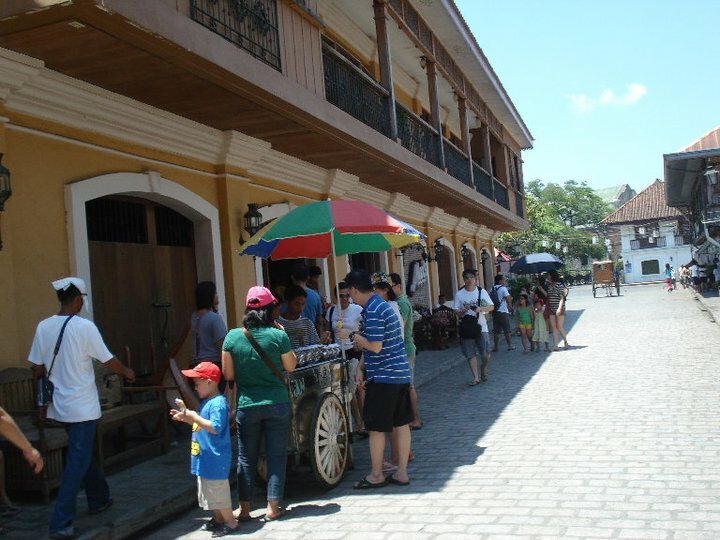 We woke up early to go to Vigan, Ilocos Sur. For breakfast, we had the local longganisa, native egg, salted egg and Sta. Lucia puto. 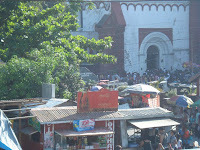 At 9:30 a.m, we left for Vigan. On the way, we saw field of tobacco and corn plantations and crystal clear blue seawaters in the nearby beaches. 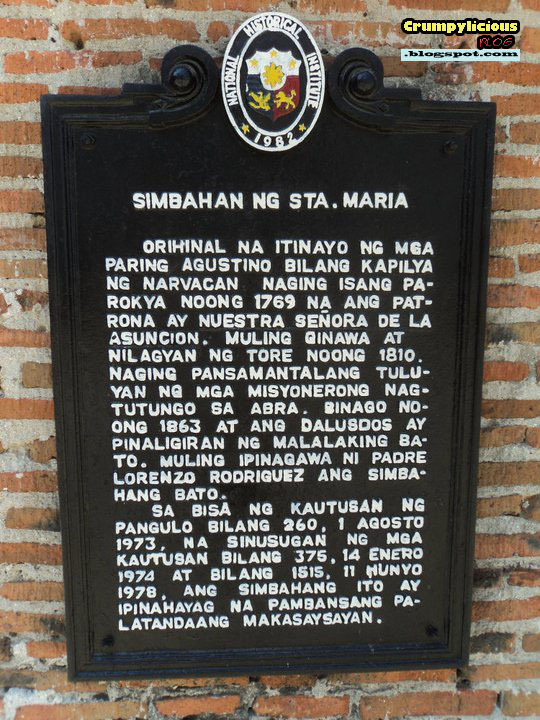 We first passed by Sta. 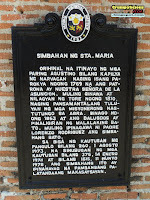 Maria church, one of the oldest churches in the Philippines. 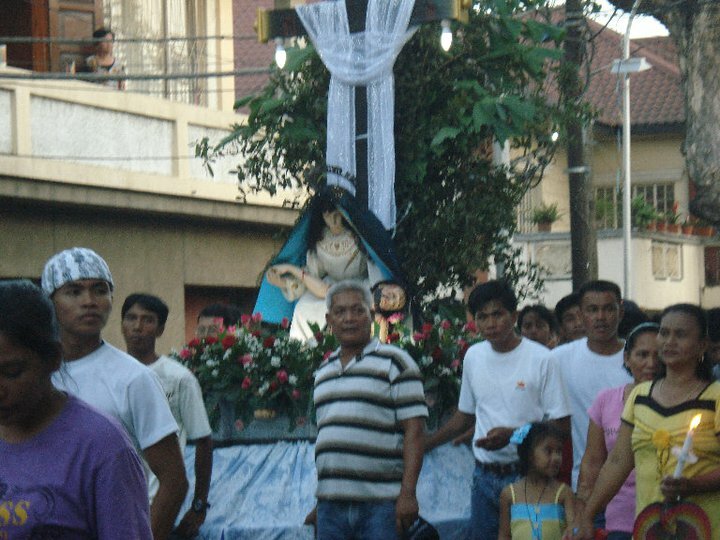 When we arrived at 10 a.m., they were already preparing for Good Friday Procession. 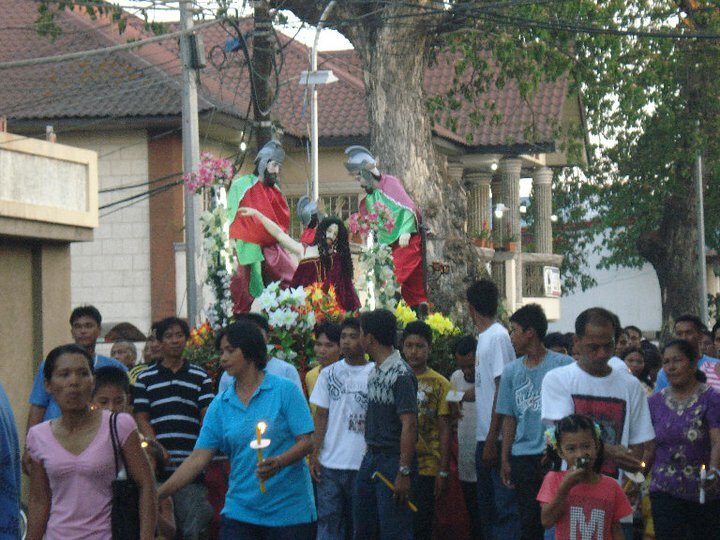 We said our prayers and left. 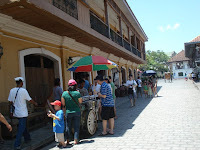 Our next stop was Chavit Singson's free and open to public Baluarte Zoo in Vigan, Ilocos Sur. 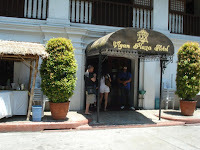 As we stepped off our van, we instantly felt the intense heat of the sun. 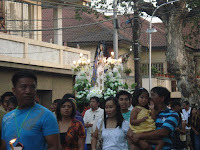 We quickly walked towards the entrance. 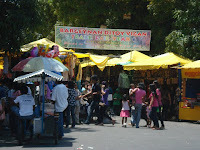 There were many vendors selling bamboo products by the entrance. The birds were also placed near the entrance. The place was crowded. Kids rode the free pony rides. 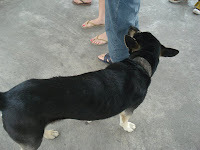 We roamed around taking pictures of every animal we saw until 1 p.m. (see separate entry) We also saw a small yellow submarine. 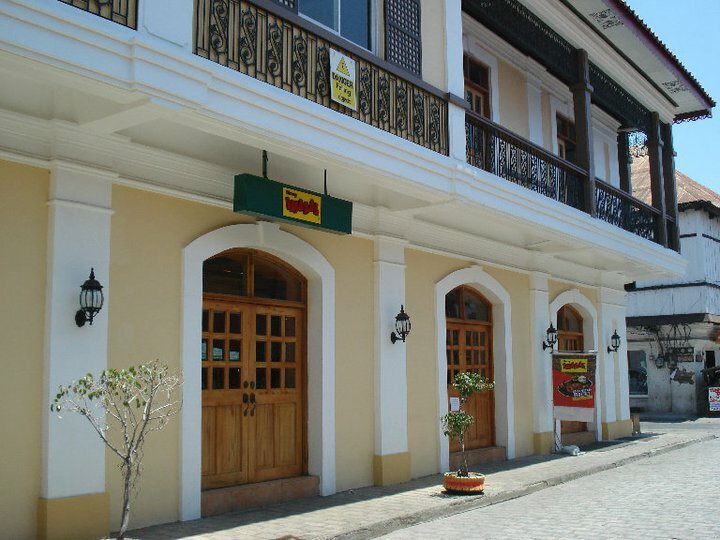 Before leaving, I bought Kurt a Vigan T-shirt (worth 160 php) from the souvenir stalls just outside Baluarte. were crowded by locals and foreigners alike. 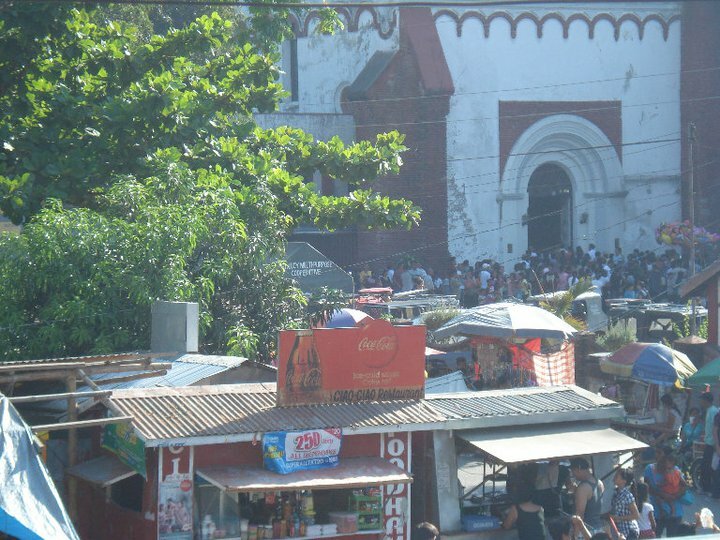 We first visited Vigan cathedral and then bought Vigan's infamous "empanadas" (worth 25 php). To our surprise the "empanadas" taste similar to the ones we bought in Sta. 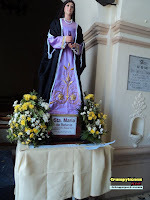 Lucia, Ilocos Sur. We also bought "okoys" (worth 25 php) but they did not appeal to our taste. It felt like seafood tempura with vinegar as sauce. 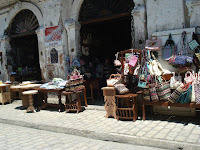 There were bazaars and souveneir shops that sold T-shirts and other locally weaved products. 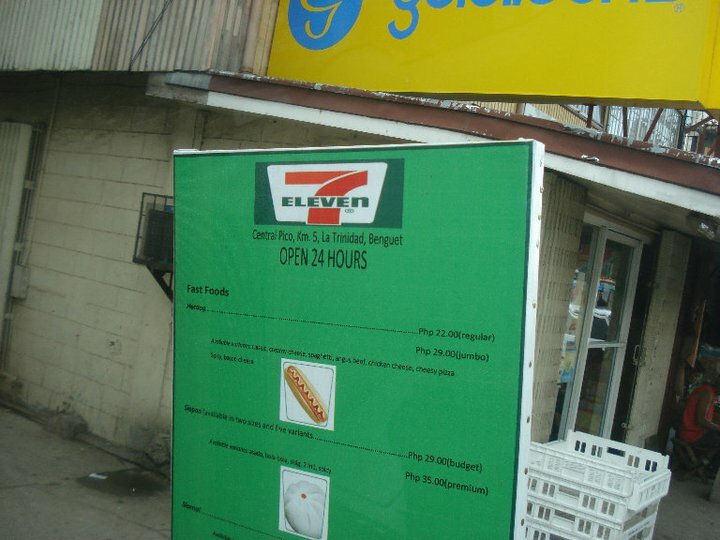 We also passed by fastfoods like Max's, Mc Do and Mang-inasal. There were also banks like BPI and BDO and hotels. 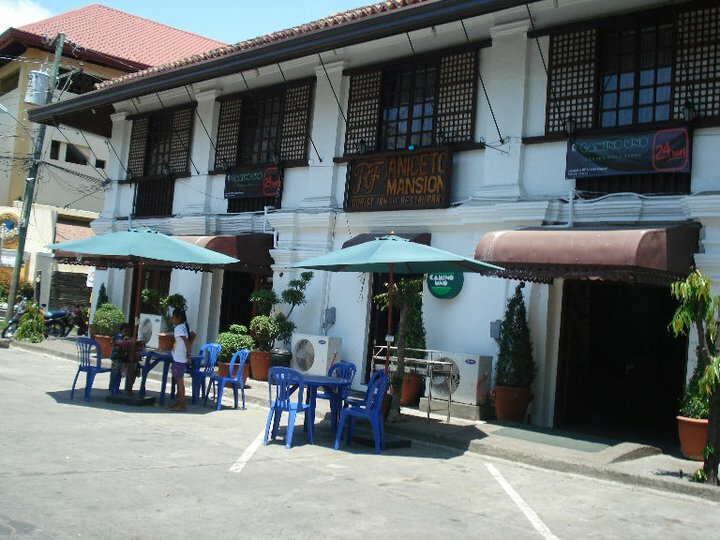 All of them maintained the old Spanish structure of the buildings which reminded me of Intramuros in Manila. 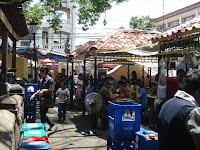 Many foreigners ate at the street-side food stalls. After lunch, we went to the "Burnayan". 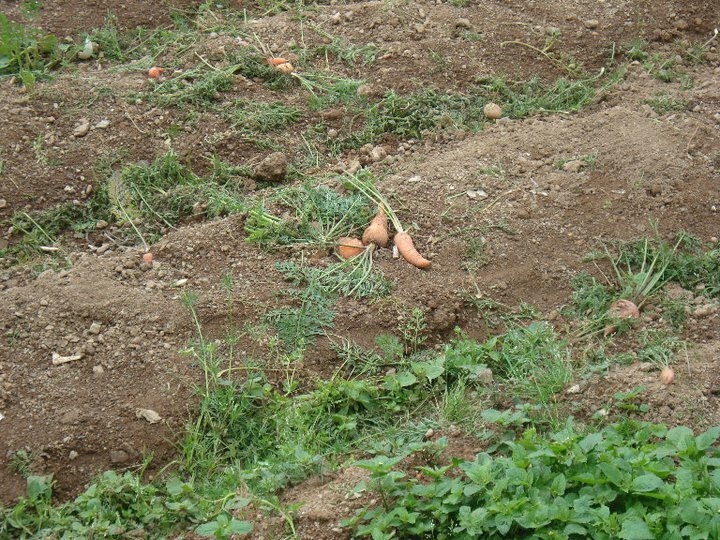 As we entered, there were many defective pots scattered on the ground. There were also bits of shattered pots. We thought of doing the pottery ourselves but when we watched manong, we got intimidated. Manong said that to be a potter you have to have the energy, talent and inspiration. He declared that he could make 100 similar pots a day because his family inspires him and that those pots are being sold for 300 php. He also added that among all those who have tried, no one has successfully made a pot. 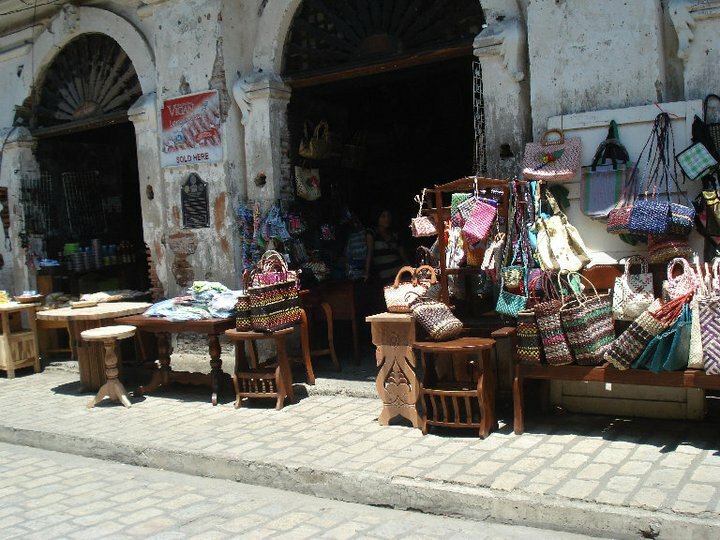 Before leaving, we bought souvenirs. 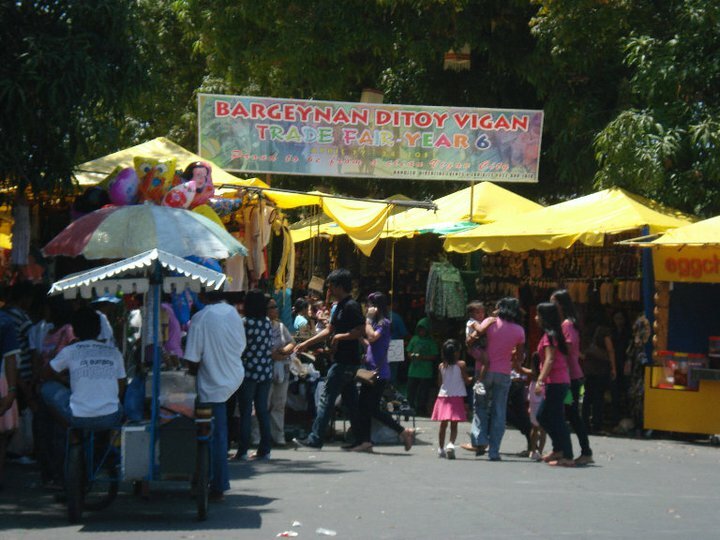 On the way back we went to "The Sisters"to buy a well-known Vigan delicacy, royal bibingkas. During our purchase, there was a car that stopped over asking for Marsha's. 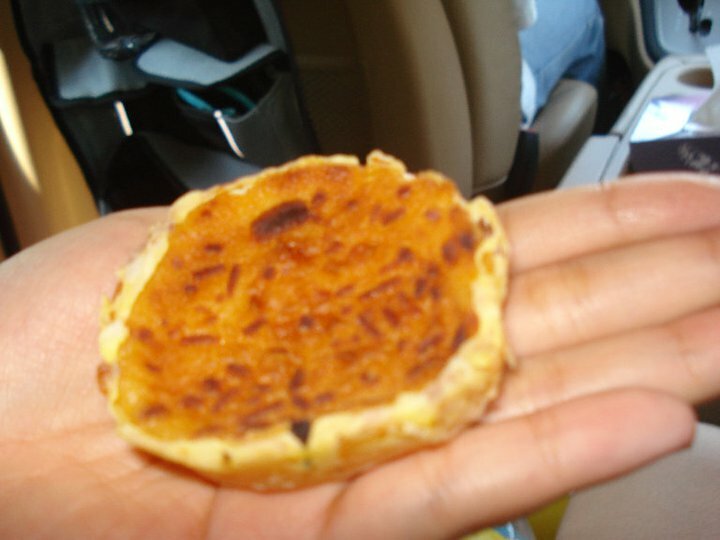 We used to buy from Masha's too until we tasted "The Sisters" royal bibingka. "The Sisters" had two stores along the hi-way one across the other. 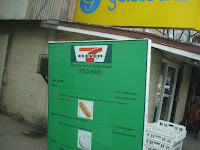 We noticed that the smaller store had a sign while the other just looked like a green house. We also bought "Jat'z" chichacorn (worth 40 php). It was very crunchy yet not difficult to bite. It was very addictive that we kept on munching on it on the way back.